Address: 1500 W Buena Vista Dr.
Now you can ski Disney! Slide down snow-capped peaks in Florida! 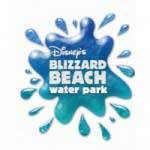 Blizzard Beach introduces the world's fastest ski jump slide where you'll go from zero to sixty in seconds. This ski resort is filled with moguls, chutes and slides guaranteed to give you the shivers. Get there early if your day is planned around doing Blizzard Beach. Between October and March only 1 of the 2 Disney Water Parks will be open at a time. Take your own food, Disney's Blizzard Beach can be expensive. Is a ski resort type transport that takes visitors who are 32 inches or taller to the top of Mount Gushmore for access to the attractions at the Green Slope area of the mountain. Is a slow, flowing stream where you can take a leisurely raft ride around the Water Park. Is a waterslide race on inner tubes for visitors who are at least 48 inches tall. Two parallel flumes pit two racers against each other in a race to the bottom of Mount Gushmore. Is a one acre wave pool for those who want to relax on a large beach area with beach chairs. Sends you twisting down the banks of Mount Gushmore for a refreshing plunge at the bottom. There are 3 unique waterslides to choose from. Has a variety of fun, water activities designed for big kids and preteens who are too old for the little ones area but not quite ready for the bigger waterslides. Is a high speed waterslide for visitors who are at least 48 inches tall. This 90 foot tall waterslide sends riders up and down as they speed over 2 humps on the way down Mount Gushmore. Are 3 slalom style racing course waterslides designed for big kids, teens and adults that use toboggan style mats to slide down. Is a 120 foot high waterslide for visitors who are at least 48 inches tall. This incredible slide has a 12 story drop and speeds riders down the mountain at 50 to 60 MPH. Is a family raft ride down a winding river. Big kids, teens and adults can all ride together in a large raft that holds 4 to 6 people. Offers tots their own watery play area. A snow castle fountain, pop up water jets and kid sized slides make this shallow water area a perfect place to play for little ones who are less than 48 inches tall. Pits up to 8 riders in a waterslide race. Big kids, teens and adults can race each other on toboggan style mats to see who can make it to the bottom of Mount Gushmore first. Dressing rooms, lockers and showers are found near the entrance to the Park.